Review: Calexico, 'The Thread That Keeps Us' The American Southwest continues to inform Calexico's sprawling, cross-cultural indie rock, but here it's a more self-contained, even lonesome affair. The Thread That Keeps Us is out now (iTunes, Amazon). Geography has a way of seeping into music, and Calexico has never shied away from that fact. Throughout the group's 22-year existence, co-founders and multi-instrumentalist Joey Burns and John Convertino have drawn on the arid clime and vibrant culture of the American Southwest — and its sister territory across the border — to inform their sprawling, cross-cultural indie rock. 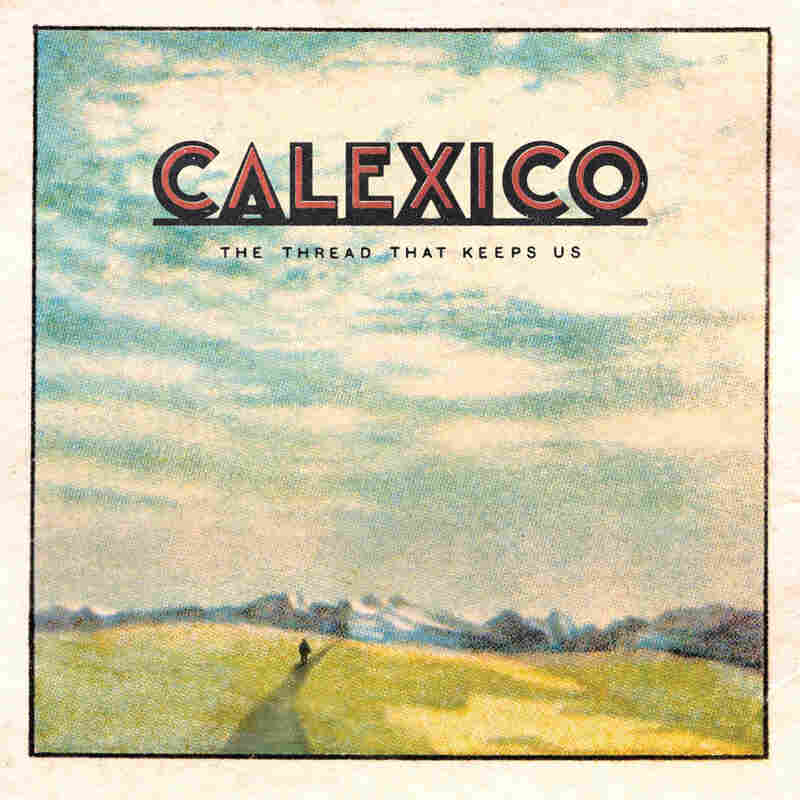 That hasn't changed on Calexico's latest album, The Thread That Keeps Us. In fact, the video for one of the record's standout tracks, "Voices In The Field," is framed by a postcard graphic that underscores its travelogue-like imagery: shot after shot of oceans, forests, mountains and deserts. That last environment is the one Calexico is best known for, with the band hailing as it does from Tucson. Accordingly, "Voices In The Field" resonates with dusty desolation and loss. "Running through fields of flower and smoke / Leaving behind all that we've built / The garden now ashes and the roof caving in," Burns sings over trembling guitar, haunting trumpet and an urgently shuffling beat. That cinematic scope carries over to songs such as "The Town & Miss Lorraine," a mystical, delicately plucked tale of a book found in a shipwreck and all the stories contained therein. "Girl In The Forest" is shrouded in echoes and acoustic strumming, a remembrance of when the narrator once "drifted out to the Sierras on an empty road." And where Calexico's last album, 2015's Edge Of The Sun, teemed with guest stars including Neko Case, Sam Beam of Iron & Wine, and Ben Bridwell of Band Of Horses, The Thread That Keeps Us is a more self-contained, even lonesome affair. On "Music Box," Burns pines for a lost love — perhaps a person, perhaps a place — with an unvarnished vulnerability: "And I want you to know / That this song's for you / And I need you to know / That I love you." That's not to say the album is all peace and quiet. "There's a little more chaos and noise in the mix than what we've done in the past," Burns recently said, and those elements are abundant on "Dead In The Water" and "Bridge To Nowhere," both of which thrust aggressive rhythms and raw riffs to the fore, even as they dwell on dark beauty and melody. "Another Space" is the most experimental cut on the record, mixing a jazz-funk undertow with bursts of electronic noise and a soaring, Miles Davis-esque tangle of brass, thanks to Calexico's superb trumpet section of Martin Wenk and Jacob Valenzuela. "You gotta vantage point / So we'll sit and watch the view / At the edge of the end of the world," Burns sings on "End Of The World With You." The video for the song, like "Voices In The Field," shows off North American scenery in all its breathtaking vastness, but it's also underpinned by the paradox at Calexico's heart: Regardless of the immenseness of the outdoors surrounding us, we're still defined — and hedged in — by time, emotion and memory. Geography may serve as a touchstone for much of Calexico's music, but The Thread That Keeps Us carves out a landscape all its own.